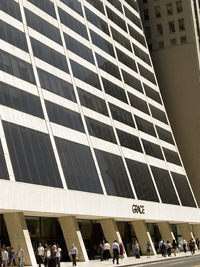 Torys' New York office is now located in the W.R. Grace Building. Designed by award-winning architects Skidmore, Owings & Merrill, the Grace Building is a New York landmark, renowned for its distinctive sloping facades. Built in 1971, it has 50 floors with oversized windows that provide extraordinary views of the Manhattan skyline, the Hudson River and Bryant Park. Main entrance is on 42nd Street. Phone and email contact information is unchanged.